Comments: Louisa Catherine Brokaw (Nee: Beam) | Farmington IL United States | 1921-1940 | Comments: This four-generation picture was taken by Will Cline at his farm south of Farmington (the north east corner of Route 78 and the Farmington Park Road). The picture was taken about 1923. Seated is Louise Beam Brokaw, 1837-1925. Standing at the left in the rear is Mary Brokaw Voorhees, 1860-1927. Standing at the right in the rear is Ethel Voorhees Cline, 1891-1975. She is holding Maxine Cline Price Hartley. Peeking over the top is Blanch Brokaw Axford. 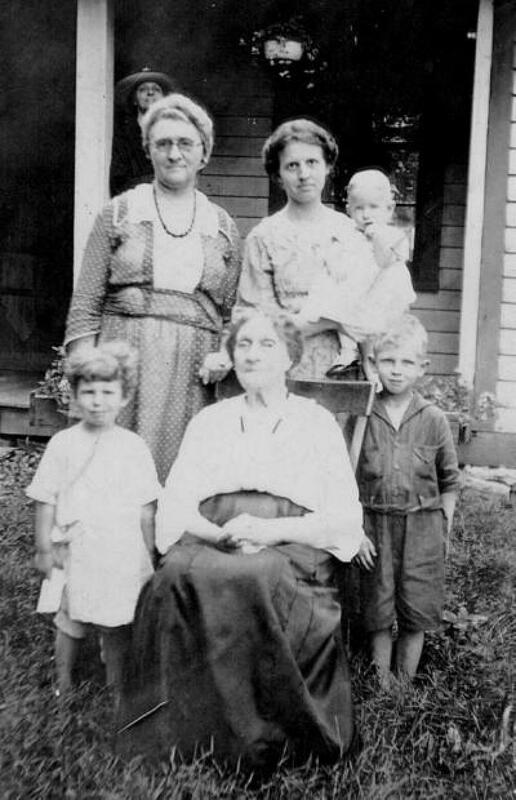 The children in front are Mary Louise Cline Wilson McMaster and Giles "Chick" Cline.